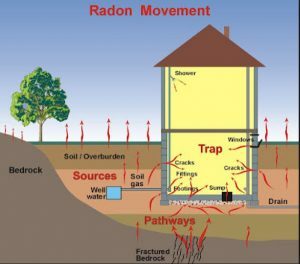 Radon is a naturally occurring gas that seeps up from the ground and through cracks, gaps and openings into your house. It occurs if your house is on top of a deposit of decaying uranium and southeastern Pa is one of the hot spots in the country for decaying uranium. It is the second leading cause of lung cancer. It doesn’t cause any damage to your house and it can be mitigated by the installation of a system. I give you a crash course on radon during the home inspection. What it is, where it comes from, how it can be addressed if your house has it, things you may want to do before you finish the basement, and other recommendations. It’s not the end of the world, nor is it uncommon, if the house you are purchasing has radon. The Environmental Protection Agency recommends that every house is tested for radon. Don’t be misled by someone who doesn’t know all the facts. I constantly run into buyers that are misinformed. They were told that because their house is on a slab or over a crawl space they don’t need a radon test. This is simply not the case. The style of house, construction type, or the age have nothing to do with whether you do or do not have radon. Testing for radon comes in two forms: active and passive. Active devices constantly measure the levels of radon in a portion of the home and display those results. Passive devices collect samples over a period of time and they are taken away and analyzed. Either method can help you determine your level of risk. Do-it-yourself kits are available from a number of outlets, normally with passive devices. Over a period of 48 hours, the device is left in the lowest level of the home which is normally occupied or could potentially be used. This eliminates crawl spaces under the house but includes finished or unfinished basements. Then the results are analyzed by a professional. The other option is to engage a qualified professional to conduct the tests properly. 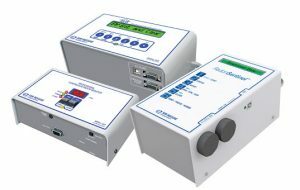 The EPA web site (http://www.epa.gov/radon/manufact.htm) provides information on finding an appropriate resource and testing devices. If your buying or selling a home, radon can be a concern, you should be aware of it , and what your options are. Every house should be tested. If test results already exist, make sure they are recent or that the home has not been significantly renovated since the test was performed. If in doubt, get a new test done. If your selling a home, having a recent radon test is a great idea. By being proactive, you can assure potential buyers that there is no risk and avoid the issue from the start. For more information, visit the EPA web site on radon at http://www.epa.gov/radon. There are several different ways to test for radon. All generally achieve the same level of accuracy provided the testing meets EPA protocol and that equipment is calibrated and properly maintained. However, some types of testing provide more information than others. Most people are familiar with the “canister” type testing. This is the least expensive testing method for the testing company. A radon technician places two small canister devises in the basement and sometimes one on the first floor. The minimum time for a radon test is 48 hours. 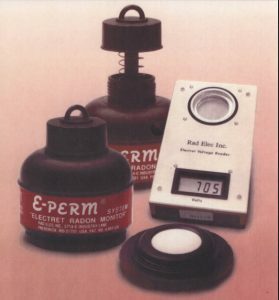 After the time period is over the technician retrieves the canisters, removes a small disk from the canister and inserts it into a device that reads it and gives a number which is the radon level. The problem with this type of testing is that it doesn’t give very much information. It only provides a final number. You don’t know what happened over the 48 hours the test was in progress. It is possible that when the technician left after placing the canisters the owner accidentally or intentionally opened the basement windows. This would dilute the radon level in the basement and, of course, lower the final reading and not be an accurate measurement. I use a testing device called a “continues readout monitor”. There are also different types of “continues readout monitors”. Some give more information than others. The monitor that I use provides the most information you can get with a radon test. It gives an hourly reading of the radon, the temperature, the humidity, and the barometric pressure every hour the test is in progress. At the end of the test the monitor averages each item providing a final reading. Gradual fluctuations in all these readings are common; however, any unusual differences could indicate an invalid test. This information enables me to determine if the test was indeed valid. If someone opens a window or a door in the basement or even on the second, if someone moves or unplugs the monitor (Battery backup), or if weather conditions were too extreme (weather can affect the radon level in your house), the monitor will tell me. In short, the radon test that I provide will give equal or more accurate results, but it also provides additional information that tells me exactly what happened during the test. It confirms that the test was done properly and that conditions and protocol were followed.